So what is PanPastel I hear you say. Well it is a premium quality Pastel range of 80 colours that can be used in all sorts of crafting applications including Card Making, Scrapbooking and Altered Art. The product is uniquely packed in a pan format and can be applied to almost any surface with Sofft Tools that were specially designed for the task. The colour is so easy to use and can be blended effortlessly, to produce some wonderful results. If you want to be one of the first to try PanPastel, we will be running 3 FREE workshops each day at the Hobbycrafts Show held at the NEC Birmingham, November 3rd – 6th 2011. The workshops will be run by Kerry Kennedy who is the PanPastel Design Team Leader. Kerry has been crafting for many years and fell in love with PanPastel the first time she tried them. During the 30 minute workshop Kerry will show you various ways in which you can use PanPastel in your craft projects. The session will be hands on, so you will be able to truly experience the product for yourself. Workshop participants will be able to take home whatever they have made during the session. The workshops can be booked on a first come first served basis, so please come and register early at Stand J11. 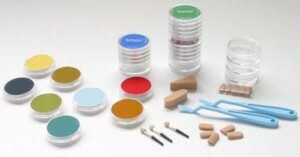 At the show we (Creativity Store – www.yourcreativitystore.com ) will bring you the full range of PanPastel single colours, PanPastel Sets & the Sofft Tools range. There will be a number of exclusive Show Offers available from the Creativity Store stand which is located adjacent to the workshop area, at Stand N12. Workshop Timings – Running Daily, Thursday 3rd – Sunday 6th November 2011, NEC Birmingham.